NASA administrator Jim Bridenstine published a bold essay yesterday in Ozy outlining the space agency’s plan to return astronauts to the Moon — and laying out a bold vision for humanity’s future beyond Earth. 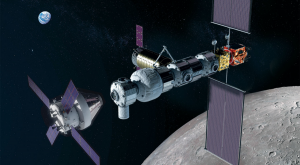 According to Bridenstine, America’s return to the moon will hinge on the Lunar Gateway, an orbiting lunar outpost that will serve as the first reusable lunar lander system for astronauts. In realizing that vision, Bridenstine emphasized the role he foresees for private spacetech ventures. NASA is currently working with nine American companies on commercial deliveries of cargo to the moon and on the Gateway project, he said. Two thirds of Americans alive today, Bridenstine pointed out, weren’t alive during the last Moon landings — including Bridenstine himself. But he emphasized that NASA’s next foray to the Moon won’t be a redux of those missions. Astronauts will venture farther onto the lunar surface and conduct new research. The missions will also, according to Bridenstine, serve as a proving ground for technologies that will take Earthlings even farther into the reaches of space.